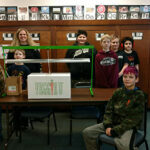 Julie Myers of Luckey Farmers stands with elementary students who received a Veggie University kit. Luckey Farmers, along with sponsorship partners CoBank and Land o Lakes recently donated $10,000 to help combat hunger in our community. The Genoa Food Pantry in Ottawa County Ohio and the St. John’s Lutheran Church Food Pantry in Wood County Ohio each received a $3350 donation. “We are proud to offer our continued support to our area food banks and the thousands of individuals they serves every year,” said Andy Swerlein, CEO of Luckey Farmers. “Although this donation will positively impact many individuals across our footprint, hunger is a national issue, and we encourage others to join our fight and volunteer at their local food bank. The remaining donation monies went to Veggie University, which offers local school districts the opportunity to teach children to grow their own vegetables. Kits were were given to elementary aged children in the Ottawa County, Sandusky County and Wood County school districts. Each kit contains soil, earthworms and seed starter packets for students to learn how to plant seeds and nurture plants into their own vegetables. The goal of the program is for students to take the lessons learned at school and grow their own vegetables at home.